Iveco, an acronym for Industrial Vehicles Corporation, is an Italian industrial vehicle manufacturing company based in Turin, Italy, and entirely controlled by CNH Industrial Group. It designs and builds light, medium and heavy commercial vehicles, quarry/construction site vehicles, city and intercity buses and special vehicles for applications such as firefighting, off-road missions, the military and civil defence. The name Iveco first appeared in 1975 after a merger of Italian, French and German brands. Its production plants are in Europe, Brazil, Russia, Australia, Africa, Argentina and China, and it has approximately 5,000 points of sales and service in over 160 countries. 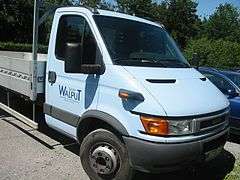 The worldwide output of the company amounts to around 150,000 commercial vehicles with a turnover of about €10,000,000,000. Iveco was incorporated on 1 January 1975, with the merger of five different brands: Fiat Veicoli Industriali (with headquarters in Turin, Italy), OM (Brescia, Italy), Lancia Veicoli Speciali (Italy), Unic (France) and Magirus-Deutz (Germany). Following the merger, the newly founded Iveco began rationalizing its product range, manufacturing plants and sales network, while keeping the original brands. From 1975 to 1979, the Iveco range included 200 basic models and 600 versions spanning from 2.7 tons of GVW for a light vehicle to over 40 tons for heavy vehicles, as well as buses and engines. In 1977 the light to medium-weight Iveco Zeta range was introduced, replacing the twenty-year-old OM Lupetto. Integrating the Fiat-OM range with the Unic and Magirus lineups was completed by 1980. Iveco moved in to work on increasing productivity and engine development. In 1978 Iveco launched the first product in the range of light vehicles branded Iveco, the Daily. The product was originally conceived as a small industrial vehicle, reliable and structurally sound. In 1980 Iveco built the first turbo diesel engine for heavy industrial vehicles. In this decade the corporate strategy was heavily oriented towards brand promotion and led to the sponsorship of sports events, such as the 1980 Olympic Games in Moscow, the Davis Cup in 1982, the Jacques Cousteau expeditions in the Amazon basin in 1983 and the Raid Pigafetta, during which the Iveco-Fiat 75 PC 4x4 was first to make a full circle of the globe. Two new divisions were also formed: bus diesel engines and firefighting vehicles. 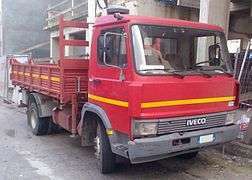 In 1984 Iveco launched the TurboStar, a heavy on-road vehicle that became a best-seller in Italy and an important player in the European market, selling a total of 50,000 in seven years. In 1985 Iveco made the first light diesel engine with direct injection. From 1986, Iveco S.p.A. held a 52% stake in Iveco Ford Truck Ltd, a joint venture (and effectively a merger) with Ford of Europe's truck division. Ford plants took over production and sales of the major vehicles in the Iveco range and continued production of the Ford Cargo. In the mid-1980s, Astra, which produces dumpers and construction site/quarry vehicles in Piacenza, became part of Iveco Group. In 1989 the first diesel engine with EGR to reduce polluting emissions compatible with commercial vehicles was produced and the new Daily launched that same year was fitted with it. In 1990, the group purchased 60% control of the Spanish industrial company ENASA, which owned the industrial vehicle builder Pegaso. In the 1990s, the EuroCargo, EuroTech, EuroTrakker and EuroStar vehicles represented a total facelift for the range. The EuroCargo and the EuroTech were named "Truck of the Year" in 1992 and 1993 respectively and, for the first time, this recognition was awarded to the same manufacturer for two years in a row. In 1991, the English company Seddon Atkinson was purchased and brought its long heritage of special vehicles for the construction and refuse collection industries. That same year, the first TurboDaily assembly line was inaugurated at the Nanjing Motor Corporation in China. In 1992, Iveco took over the primary constructor of industrial vehicles in Australia to form Ital, originally called International Trucks Australia. In 2000 it was renamed Iveco Trucks Australia Limited. In 1995 Iveco signed an agreement with Yuejin Motor Corporation of Nanjing to form the Naveco joint venture for the production of light vehicles and diesel engines. In the meantime, the firefighting vehicles division signed an agreement with Sinopec Group for the assembly of special vehicles with foam extinguishers in China. In 1996 firefighting activities in Germany were structured under the company Iveco Magirus Brandschutztechnik GmbH. The following year, these activities were boosted by the arrival of an Austrian company, Löhr, which then became Löhr Magirus. The Italian plant in Foggia broke the record of 2.5 million engines produced in 20 years. In 1999, the production of diesel powertrains reached its highest volume of 405,000 units. In 1998 Cursor 8 was launched, followed the next year by Cursor 10, the first diesel engine with a variable geometry turbine and the first common rail diesel engine for heavy industrial vehicles. The 125th anniversary of the presentation of the first Magirus ladder was celebrated together with the delivery of the five-thousandth Magirus aerial ladder produced since the Second World War. 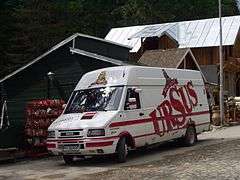 In 2003 Iveco entirely bought out Irisbus, originally part of a joint venture with Renault. In 2004 Iveco Motors brand was born, which became an umbrella for the production of engines, and the following year it was incorporated into the newly founded Fiat Powertrain Technologies. At the end of 2004, the agreement was reached between Iveco and the Chinese company Saic (Shanghai Automotive Industry Corporation). In 2006 Iveco sponsored the Winter Olympic Games in Turin with a fleet of 1,200 Iveco Irisbus buses. The year after, Iveco became sponsor of the All Blacks, New Zealand's rugby team. 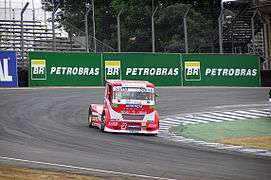 In 2009 Iveco became the Trucks and Commercial Vehicle Supplier for the Moto GP, together with the historical sponsorship to the Ferrari Racing Team, for which it supplies the vehicles that transport the single-seaters at all the Formula 1 World Championship races. On 1 January 2011, Fiat Industrial was formed, incorporating CNH, Iveco and FPT Industrial. In September of the same year, the Fiat Industrial Village was inaugurated in Turin, a multipurpose centre belonging to Fiat Industrial and created for the sales, assistance and product presentation for the Iveco, New Holland and FPT Industrial brands. On 15 January 2012, Iveco won the 33rd edition of the Dakar rally with the Petronas De Rooy team and the Dutch driver Gerard De Rooy, behind the wheel of an Iveco Powerstar. De Rooy was followed by drivers Stacey and Biasion behind the wheel of two Iveco Trakker Evolution 2 vehicles, equipped with an FPT Industrial C13 engine with over 900 hp. Iveco is the brand under which the light, medium and heavy vehicles are sold. The range of light vehicles is made up of the New Daily in its versions from 2.8 T to 7.0 T and with 4x4 drive. The range of medium vehicles includes the Eurocargo, available from 7 T to 19T and with 4x2 or 4x4 drive. Stralis and Trakker, from 19 T to 72 T, make up the heavy vehicle range in two, three, or four-axled versions with all-wheel drive or two-wheel drive. S-series (1978), "Daily", also sold as a Fiat and as the OM Grinta. TurboDaily from 1986. Z-series (1976), "Zeta". Also sold as a Fiat, OM, Magirus-Deutz, and as a Saurer-OM. TurboZeta from 1987. Iveco-Magirus MK (1975) – Iveco-badged versions of Magirus' Club of Four cab were sold in Germany and some other markets. Ford Cargo, sold as an Iveco-Ford in the UK from 1986 until 1991. EuroCargo (1991), replaced the Zeta. Full model change in 2003, now with Bertone design. P/T/TA (1970), bonneted Magirus-Deutz off-road truck, with Iveco badging from the early 1980s. Built until 2003, mainly for non-European markets for the last decade. N-series (1976), also NC and NVN. Also known as the "Turbo" or "T"-series and originally sold as a Fiat. Facelifted in 1981. EuroStar/Tech/Trakker (1993). Direct successors to the TurboStar/TurboTech, with the EuroTrakker being intended for offroad or construction work. Stralis (2002), replaces the heavy "Euro" series. Facelifted in 2007 and again in 2012. Irisbus was a brand specialising in passenger transport vehicles spanning from minibuses to buses for city and intercity transportation and tour buses. On 24 May 2013 the brand was relaunched as Iveco Bus. Iveco Astra is a brand dedicated to off-road vehicles for construction and mining industry. It produces heavy on-road and off-road vehicles as well as heavy tractors for road transport and logistics vehicles, including armoured vehicles for the military. The company was founded in 1946, but has been part of Iveco since 1986. Iveco Magirus is the brand dedicated to firefighting vehicles and their fittings. Iveco Magirus also produces aerial ladders, an industry in which it is the world leader. It was founded in 1866 as "Magirus Kommanditist" by Conrad Dietrich Magirus, fire chief in Ulm, Germany, who also invented the ladders for the firefighting vehicles. Defence Vehicles specialises in military vehicles. Its headquarters are located in Bolzano, where the Iveco LMV is produced, one of the brand's most famous vehicles used by many armies in Europe and abroad. Iveco Capital is Iveco's financial division which provides financing for customers to purchase vehicles. Pregnana Milanese (Lombardy, Italy), production of industrial and marine engines (S, N e C). In 2011 Iveco's net revenues were €9,600,000,000, a 15.1% increase over the previous year. The trading profit was €490,000,000. A total of 153,384 vehicles were delivered, an 18.3% increase over 2010. Iveco engines from the Cursor and Tector ranges observe the upcoming Euro VI standards by adopting High Efficiency SCR (HI-eSCR) technology. This technology optimises the processes of exhaust combustion and after-treatment, reducing consumption and enabling achievement of greater efficiency in the conversion of NOx emissions. Iveco developed and built the first Daily with electric propulsion in 1986; later the range was broadened to include trucks and city buses. Iveco introduced the New Daily with electric propulsion and zero exhaust emissions in which a battery system powers an electric three-phase asynchronous engine – through the aid of an inverter – in charge of moving the vehicle directly and recovering energy during braking. The vehicle runs on two to four batteries made with Na/NiCl2 (Sodium-nickel chlorine) technology at a nominal voltage of 278 Volt. The maximum velocity is electronically limited to 70 km/h and the vehicle does from 90 to 130 km on a fully charged battery, depending on the number of batteries and the mission. the 7.5-ton version uses a Tector Diesel FPT Industrial engine with 16 valves and 4 Euro V cylinders, with a maximum power of 160 hp (118 kW); this is paired with a drive system made of an electric motor-generator with 60 hp (44 kW), a 6-speed automated gearbox and a lithium ion battery pack (Li-Ion) of rated capacity 1.8 kWh. The 12-ton version uses the FPT Industrial Tector engine with 16 valves and 4 EEV cylinders with a maximum power of 180 hp (132 kW), paired with an electric motor-generator with 60 hp (44 kW), a 6-speed automated gear box and a lithium ion battery pack (Li-Ion) of rated capacity 1.8 kWh. Iveco has been active in this sector since 1990 with 6, 7, 4 and 12 metre buses for urban transportation. The series hybrid technology features a diesel engine – smaller than that of a traditional vehicle – that acts as a battery charger. Iveco's range of light, medium and heavy vehicles and buses can run on methane. Methane makes it possible to save on consumption by 38% per kg transported as compared to that consumed by diesel engines for the same payload and distance travelled. In addition, compared to Euro VI diesel engines, methane engines reduce NOx emissions by approximately 60% and particulates emissions by approximately 70%. In April 2012 Iveco presented its first vehicle with this technology, the Stralis LNG. As opposed to vehicles with CNG technology, LNG technology takes the vehicle farther on a full tank (up to 750 km) and reduces the vehicle's tare thus increasing the load. The main difference between the two technologies lies in the type of natural gas storage employed, which in this case is kept in a liquid state at −161 °C in cryogenic tanks; it is then heated in a heat exchanger so that once it reaches the engine it is a gas. Also, the noise emitted decreases by 3 to 6 decibels over an analogous diesel engine vehicle. Iveco created the first prototype of a bifuel, diesel and ethanol-run vehicle. The technology was developed by Iveco together with FPT Industrial and Bosch. The prototype uses a Trakker truck with Common Rail Cursor 9 engine with 360 HP that may be powered by a 40–60% ethanol-diesel blend. The prototype was tested by Raízen, a joint venture between the cane sugar producer Cosan and Shell. In 2011, this prototype earned Iveco the "Prêmio Top Etanol" – for the alternative fuel technology. A prototype of a heat pump system for electric and hybrid vehicles was installed on the Iveco Daily vehicle. The system cools or heats the passenger compartment by transferring low temperature heat generated by the drive systems. At the same time, the control strategies minimise the energy demand in order to achieve a low impact on consumption. Iveco Indcar Mago 2 midibus in Jyväskylä, Finland. ↑ "Fiat Industrial 2011 Annual Report" (PDF). Fiat Industrial. p. 19. ↑ "History of Iveco / 1975–1984". fiatindustrial.com. Retrieved 4 April 2013. 1 2 Norbye, Jan (September 1982). Kennett, Pat, ed. "Intertruck: Italy". TRUCK. London, UK: FF Publishing Ltd: 27. ↑ "Fiat Industrial 2011 Annual Report" (PDF). Fiat. p. 103. 1 2 "History of Iveco 1984-1994". Fiat Industrial Official. Archived from the original on June 26, 2012. 1 2 3 "History of Iveco 1995-2004". Fiat Industrial Official. Archived from the original on June 26, 2012. ↑ "Concluso Accordo TRA IVECO, Fiat Powertain Technologies (FPT) E Saic Motor Coperation NEL Settore Dei Motori Medi e Pesanti" (PDF) (in Italian). ↑ "The Fiat Group and the Torino 2006 Olympic Winter Games" (PDF). ↑ "Iveco & All Blacks, quando il gioco si fa duro – Motori – Repubblica.it". repubblica.it. Retrieved November 27, 2015. ↑ "Official Sponsor". MotoGP Official website. ↑ "Fornitori Ufficiali". Ferrari Official website (in Italian). Archived from the original on June 15, 2012. ↑ "History". Fiat Industrial Official website. Archived from the original on January 13, 2012. ↑ "A Torino nasce il Fiat Industrial Village" (PDF). Fiat Industrial website (in Italian). Archived from the original (PDF) on July 11, 2012. ↑ "Ranking Overall at Stage 14 Pisco> Lima". Dakar Official Website. Archived from the original on June 30, 2012. ↑ "IVECO website". Iveco Official website. ↑ "Press Release". iveco official website. CNH Industrial Company. 24 May 2013. ↑ "Irisbus homepage". 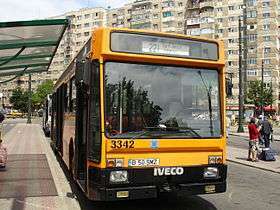 Iveco Irisbus. ↑ "Iveco Astra Official website". ↑ MAGIRUS. "Magirus GmbH: Hersteller von Feuerwehrfahrzeugen & Brandschutztechnik". iveco-magirus.de. Retrieved November 27, 2015. ↑ "Iveco Defence Vehicles - Military Vehicles and Trucks". Army-technology.com. ↑ "Servizi Finanziari - Iveco Capital". Iveco Capital Official website (in Italian). 1 2 "Fiat Industrial 2011 Annual Report" (PDF). Fiat Industrial. p. 99. ↑ "Fiat Industrial 2011 Annual Report" (PDF). Fiat Industrial. p. 111. 1 2 "Fiat Industrial 2011 Annual Report" (PDF). Fiat Industrial. p. 66. ↑ "Fiat Industrial 2011 Annual Report" (PDF). Fiat Industrial. p. 67. ↑ "Fiat Industrial 2011 Sustainability Report" (PDF). Fiat Industrial. p. 76. ↑ "Fiat Industrial 2011 Sustainability Report" (PDF). Fiat Industrial. p. 28. ↑ "Fiat Industrial 2011 Sustainability Report" (PDF). Fiat Industrial. p. 75. 1 2 3 "Fiat Industrial 2011 Sustainability Report" (PDF). Fiat Industrial. p. 81. ↑ "Technology Highlights". Fiat Industrial Official website. Archived from the original on September 2, 2012. ↑ "Fiat Industrial 2011 Sustainability Report" (PDF). Fiat Industrial. p. 82. 1 2 3 "Diesel – Electric Parallel Hybrid Traction". Iveco Official website. Archived from the original on July 1, 2012. ↑ "Fiat Industrial 2011 Annual Report" (PDF). Fiat Industrial. p. 51. ↑ "Iveco Press Room". Iveco Official website. 1 2 3 4 "Fiat Industrial 2011 Sustainability Report" (PDF). Fiat Industrial. p. 80. 1 2 "40% ethanol, 60% diesel buses offer 6% fuel savings, says Iveco". Biofuel Digest. 18 May 2011. ↑ "Innovative Air-Conditioning Systems For Conventional and Electric Vehicles" (PDF). Ice Projects. ↑ "Iveco's new Eurocargo lifts The 2016 International Truck of the Year Award at the Solutrans Commercial Vehicle show in Lyon". Truck of the Year Official website. ↑ "International Coach Of The Year". Busworld Official Website. Busworld. 1 2 "Winners". Van of the Year. ↑ "Iveco's Stralis Hi-Way Lifts The 2013 International Truck of the year Trophy at the 64 Thiaa Commercial Vehicle Show". Truck of the Year Official website. Archived from the original on October 21, 2013. 1 2 "The new Daily wins awards in Germany and Spain". Iveco Official website. Archived from the original on February 4, 2012. 1 2 3 "Winners". Truck of the Year Official Website. ↑ "Iveco wins the "Prize of Prizes" for Innovation". Iveco Official website. Archived from the original on July 1, 2012. Retrieved November 27, 2015. ↑ "Iveco Tector is Brazilian "Truck of the Year"". Iveco Official website. Archived from the original on July 1, 2012. ↑ "Main Awards– Veicoli Industriali" (PDF). Fiat Industrial Official website (in Italian). Archived from the original (PDF) on July 10, 2012. 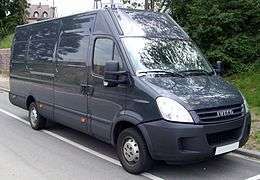 Wikimedia Commons has media related to Iveco vehicles.